An international team of astronomers has looked at something very big -- a distant galaxy -- to study the behavior of things very small -- atoms and molecules -- to gain vital clues about the fundamental nature of our entire Universe. The team used the National Science Foundation's Robert C. Byrd Green Bank Telescope (GBT) to test whether the laws of nature have changed over vast spans of cosmic time. "The fundamental constants of physics are expected to remain fixed across space and time; that's why they're called constants! Now, however, new theoretical models for the basic structure of matter indicate that they may change. We're testing these predictions." said Nissim Kanekar, an astronomer at the National Radio Astronomy Observatory (NRAO), in Socorro, New Mexico. So far, the scientists' measurements show no change in the constants. "We've put the most stringent limits yet on some changes in these constants, but that's not the end of the story," said Christopher Carilli, another NRAO astronomer. "This is the exciting frontier where astronomy meets particle physics," Carilli explained. The research can help answer fundamental questions about whether the basic components of matter are tiny particles or tiny vibrating strings, how many dimensions the Universe has, and the nature of "dark energy." The astronomers were looking for changes in two quantities: the ratio of the masses of the electron and the proton, and a number physicists call the fine structure constant, a combination of the electron charge, the speed of light and the Planck constant. These values, considered fundamental physical constants, once were "taken as time independent, with values given once and forever" said German particle physicist Christof Wetterich. However, Wetterich explained, "the viewpoint of modern particle theory has changed in recent years," with ideas such as superstring theory and extra dimensions in spacetime calling for the "constants" to change over time, he said. 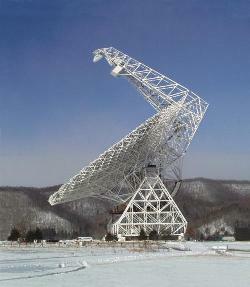 The astronomers used the GBT to detect and study radio emissions at four specific frequencies between 1612 MHz and 1720 MHz coming from hydroxyl (OH) molecules in a galaxy more than 6 billion light-years from Earth, seen as it was at roughly half the Universe's current age. Each of the four frequencies represents a specific change in the energy level of the molecule. The exact frequency emitted or absorbed when the molecule undergoes a transition from one energy level to another depends on the values of the fundamental physical constants. However, each of the four frequencies studied in the OH molecule will react differently to a change in the constants. That difference is what the astronomers sought to detect using the GBT, which, Kanekar explained, is the ideal telescope for this work because of its technical capabilities and its location in the National Radio Quiet Zone, where radio interference is at a minimum. "We can place very tight limits on changes in the physical constants by studying the behavior of these OH molecules at a time when the Universe was only about half its current age, and comparing this result to how the molecules behave today in the laboratory," said Karl Menten of the Max-Planck Institute for Radioastronomy in Germany. Wetterich, a theorist, welcomes the new capability, saying the observational method "seems very promising to obtain perhaps the most accurate values for such possible time changes of the constants." He pointed out that, while some theoretical models call for the constants to change only in the early moments after the Big Bang, models of the recently-discovered, mysterious "dark energy" that seems to be accelerating the Universe's expansion call for changes "even in the last couple of billion years." "Only observations can tell," he said. This research ties together the theoretical and observational work of Wetterich and Carilli, this year's winners of the prestigious Max Planck Research Award of the Alexander von Humboldt Foundation and the Max Planck Society in Germany. Menten and Carilli have collaborated on research in this area for years, and Kanekar has pioneered the OH molecular technique. Kanekar, Carilli and Menten worked with Glen Langston of NRAO, Graca Rocha of the Cavendish Laboratory in the UK, Francoise Combes of the Paris Observatory, Ravi Subrahmanyan of the Australia Telescope National Facility (ATNF), John Stocke of the University of Colorado, Frank Briggs of the ATNF and the Australian National University, and Tommy Wiklind of the Space Telescope Science Institute in Sweden. The scientists reported their findings in the December 31 edition of the scientific journal Physical Review Letters.